In collaboration with Scottish Widows. What could you do in an hour? Lately I am finding that there just doesn’t seem to be enough time in the day to do everything I need (or want) to do. Things need to be prioritised and other things, which might not seem that important right now but will be in the future, get pushed to the back of the pile. I have teamed up with Scottish Widows who have been exploring the concept of time and how we can make the very most of the time we’ve got. This has got me thinking about the little things that I do at home that help me save time, and the time I take out of each day for myself to recharge and try to regain some balance in an increasingly hectic world. Scottish Widows has commissioned research exploring how people spend, and waste, their time, and what activities they think are valuable. Did you know, that on average, every Brit wastes 80 minutes of every day on activities that they admit are a waste of their time? This adds up to 21 days in a year! The average Brit spends over two hours a day on social media and browsing the internet, and the top ways in which we are wasting our time are: deciding what to wear (46%); losing the car in the carpark (41%), online window shopping for clothes they can’t afford (23%), rifling through one’s handbag (35%) and watching animal videos online (17%). As a self-employed stay at home mother and wife most of the family cooking is left to me – since I’m here, in my kitchen office, all day every day anyway. As much as I love cooking I don’t want to spend ages standing over a hot cooker, so, for many of our regular family favourite comfort food recipes I’ve created some food hacks around them to save time and money. Things I can make in advance and then have a bit of spare time for a bike ride, or a brisk hill walk. Here are my food hacks for maximising just one hour: the time it takes to make dinner and what I do, for me time, while that dinner is baking in the oven. Shop local. Your food will taste better because of it, you will be directly supporting your friends and neighbours and therefore the local economy, and with lower food miles you’ll be doing your bit for the environment. It also saves time to use your local village or corner shop instead of driving to a supermarket. 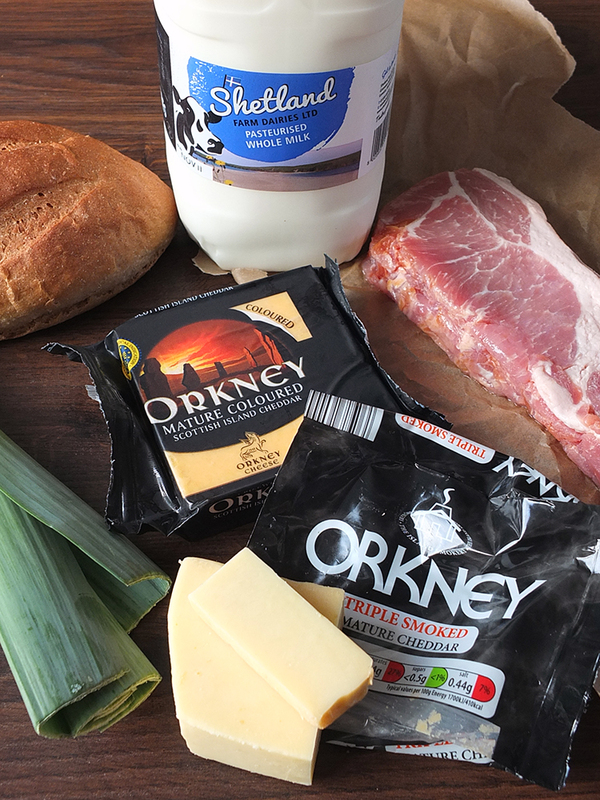 I make my family favourite macaroni and cheese with as much local produce as I can cram into it – organic veg box leeks, Shetland milk, smoked back bacon from the Anderson butchers, bread from the Quernstone Bakery and cheddar cheese from Orkney, our nearest island neighbours to the south. In all honesty this recipe varies depending on what kind of ingredients I can get at my local village shop, and as luck should have it this week they had a gorgeous new triple smoked cheddar cheese, but any smoked cheddar will work. I’m quite fond of Applewood too, if I can’t get Orkney cheese. Freeze any leftover bacon right away instead of storing it in the fridge (and then, if you’re like me, promptly forgetting about it), and just chop off what you need for recipes from frozen. This doesn’t work if you’re wanting bacon with your fry up, but freezer bacon is perfect if you’re wanting a little bacon in a pasta dish, or fried with some steamed Brussels sprouts, etc. 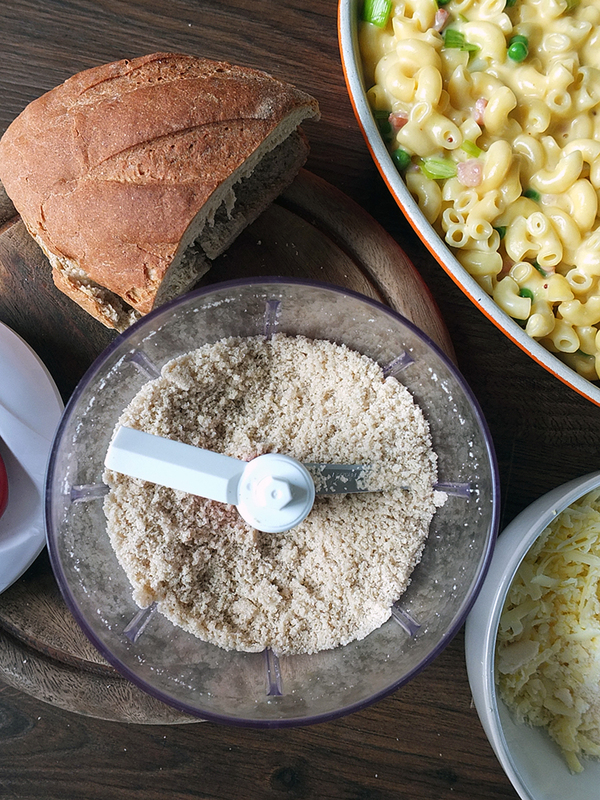 Make your own fresh breadcrumbs. I’ve got a mini hand held food processor which makes short work out of a loaf of stale bread (gone stale, say, because you completely forgot to collect your veg box containing said loaf from the drop off point until two days later). Pop the bread crumbs into a bag or plastic container and freeze until needed. Alternatively you could lay them out on a baking tray and leave them to air dry for a day or two and then store in an empty jam jar. To save even more time, before you start preparing this recipe put a tray of frozen chunky oven chips on to cook. By the time you’ve got to the melted cheese stage the oven chips will be ready and crying out to be dunked in a gorgeous big bowl of oozy macaroni and cheese, sitting on the couch, of course, in front of the telly. If you’re wanting a crispy topping though, it takes only a matter of seconds to whip up, especially if you’ve got frozen bread crumbs. Just grab a handful from the freezer, mix with some cheese and melted butter, sprinkle over the top of the macaroni and cheese and pop into the oven. To save even more time (and washing up) omit the melted butter and just dot the top with little bits of butter. 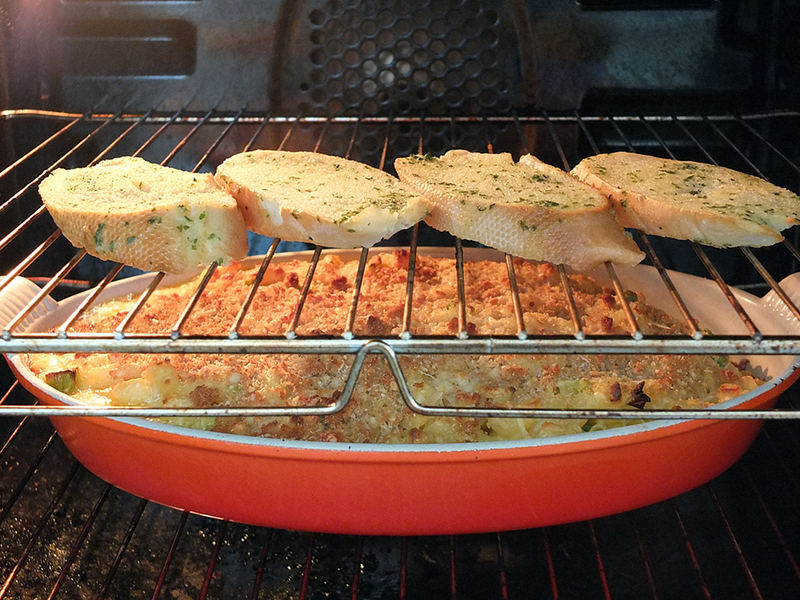 Five to ten minutes before the macaroni and cheese is ready, transfer it to the bottom rack in the oven and heat up some ready made frozen garlic toasts on the rack above it! While the macaroni and cheese is baking away in the oven you’ve got a full thirty minutes (you could stretch it to forty without any ill effects too!) to do what you want. Time for you! Watch the video below to see what I did when my mac n’ cheese was in the oven! The NHS recommends that adults take thirty minutes of exercise at least five days a week for optimum health benefits, and what better time to do this than when dinner is in the oven? Then you can feel all virtuous when you come back from your walk, rosy cheeked and energetic, and feel like you’ve earned a proper plateful of ooey gooey mac and cheese. home made macaroni and cheese can be frozen (before the topping is added). Defrost thoroughly before cooking. batch cook the cheese sauce. I often make a big batch and then freeze it into smaller portions for the kids, then all I need to do is cook pasta for dinner and serve with a veg on the side. leftover grated cheese can be frozen too, and store those Parmesan rinds in the freezer for use in soups later. 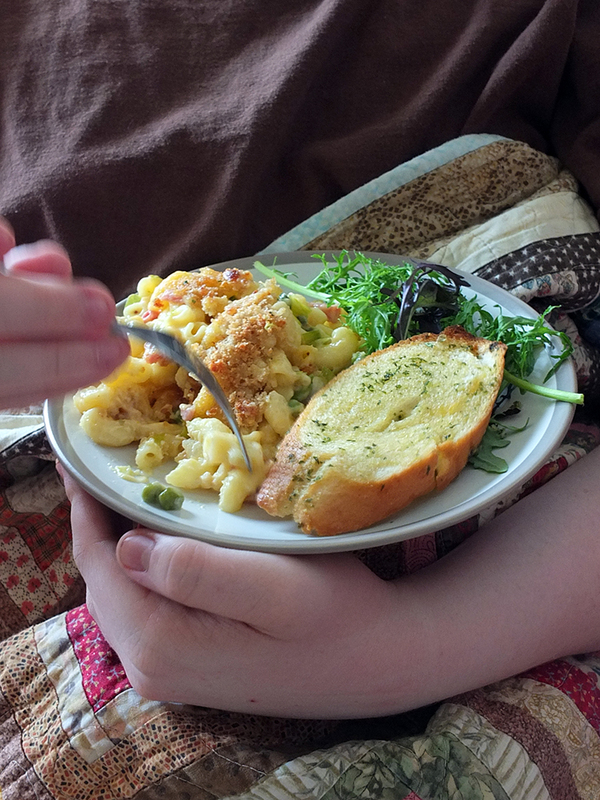 leftover macaroni cheese reheats really well on the stove top for lunch the next day. Simply pour in a splash of milk or two and reheat over a medium heat in a saucepan. don’t measure the ingredients. This is one of those recipes I just make by eye every time, and it saves time on washing up. make the sauce in the pan you are going to bake the macaroni dish in saving with washing up! How do you feel you waste your time? 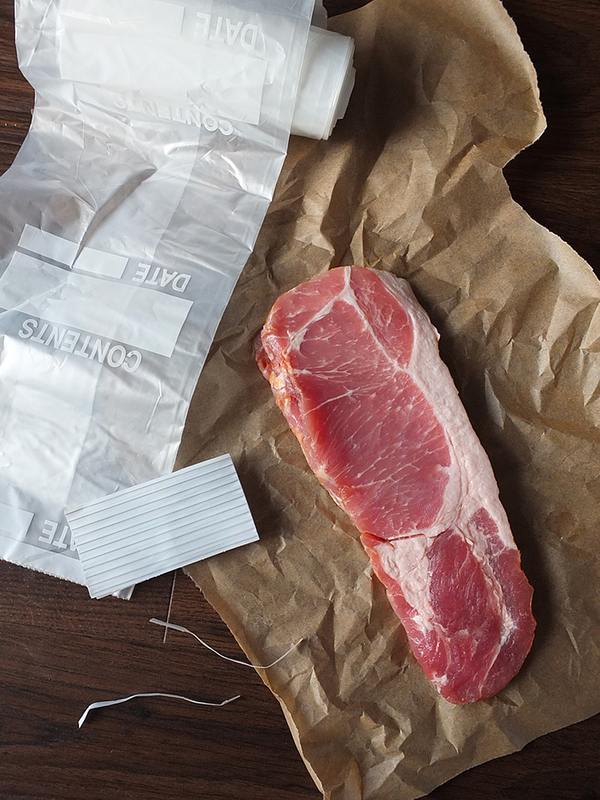 What food hacks do you use to help save time? How do you make the most of an hour? Let me know in the comments! Our family favourite comfort food recipe - quick and easy to make with an optional crispy topping. Preheat oven to 200 C/ 180 C fan. Cook macaroni in boiling, salted water for two minutes less than the packet instructions suggest. Drain & set aside. Heat 1 tbsp butter in a saute pan and fry the bacon until it begins to brown. Add the finely sliced leeks and cook for a few minutes until they begin to soften. Add the frozen peas, give it a stir and set aside. Meanwhile, heat the remaining butter in a saucepan until melted and bubbling. Stir in the flour and cook for one minute. Remove from the heat and whisk in a little of the milk until combined. Slowly stir in the remaining milk and return to the heat, stirring until thickened. Remove from the heat and add the grated cheeses, mustard and cayenne. Stir well until the cheese has melted. To prepare the topping mix the ingredients together and sprinkle over the top of the macaroni and cheese. Bake, in the centre of the oven, for 30 minutes. This is a commissioned recipe post in collaboration with Scottish Widows. All thoughts and opinions expressed are our own. Thank you for supporting the brands who make it possible for me to do what I love: mess up my kitchen and share recipe stories. This mac & cheese looks amazing! I would love to dive into all that lusciousness! 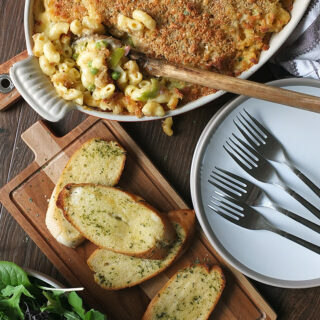 Fabulous mac ‘n cheese recipe with an amazing combination of cheeses, YUM! Love the hacks too – terrific!! Mac N Cheese is always a winner in our house. You have truly elevated your dish to the next level. What a nice recipe to entertain with. I’ve recently discovered my love for mac and cheese and this looks super yummy! Thanks so much for this – I want to plan cooking foods better and this will defo be on my list. I love macaroni cheese and we have it frequently. I Have never thought of adding bits to it though, and love the combo of bacon and leeks, so they will definitely be going in my next batch! I make risotto with the same trio of ingredients too. It tastes lovely! Mac&Cheese is my go-to meal! It’s easy to make, you only need a couple of pots and it freezes so well. And, well, there’s cheese. Love the tips! In the last few weeks I’ve tried to make an effort to shop local, and it’s a bit more effort, but I find it well worth it! Now this is mac-n-cheese done right! I’m going to try it! 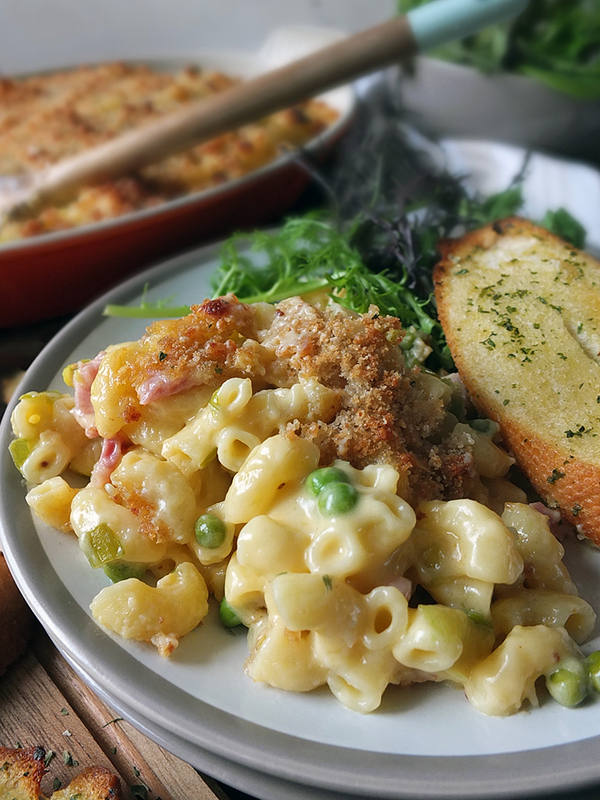 Your macaroni cheese looks amazing! I need to try this recipe out at home! This looks delicious! Its such a comforting meal to have and so simple to make. I pop things in the oven and then take the dogs out for a run around our paddock …. you really feel like you’ve earned your meal after a bit of fresh air don’t you … and the dogs appreciate it too. 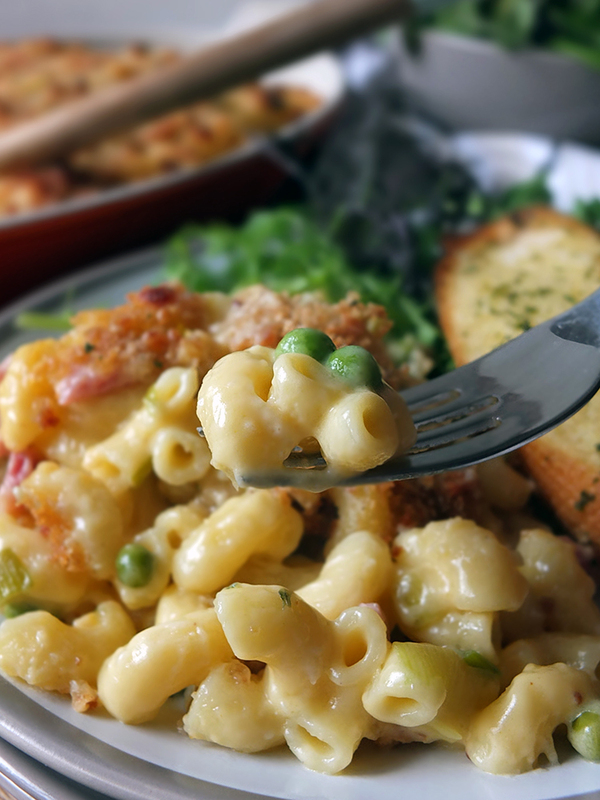 I love macaroni and cheese love the look of this recipe a great way to get some veg into u. Some great hacks too. My OH would love macaroni cheese with leeks, what a great idea. I make a version with Brussels sprouts which is delicious. 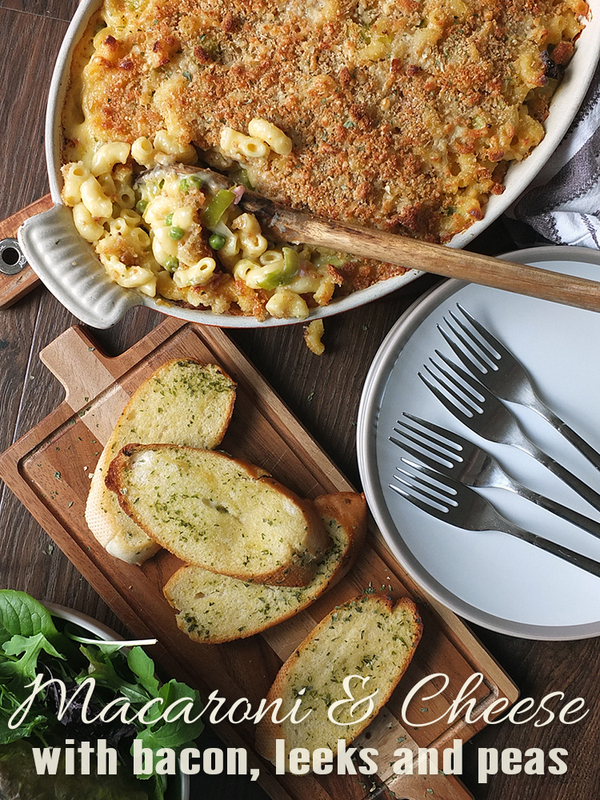 My kids love Mac and Cheese, this recipe looks so amazing and I just love the food photography, simply ravishing! I’m hungry again! Shopping locally is so important to me, and it does make things easier! A good mac ‘n cheese recipe is always a winner. This looks incredibly mouth watering!! I love pasta so much and I find cooking in my spare time very therapeutic!! Mac and cheese must have to be the most comforting meal EVER! I love the look of this and the addition of bacon is genius. I’m terrible for wasting time too. One pot dishes are definitely a help! Perfect winter comfort food. I wonder what I could replace bacon and leeks with? I was licking my lips throughout this entire post. & love a bowl of mac and cheese and I love the twist you have put on it! This looks SO amazing! I must try this! It’s true, I do tend to waste a lot of time, even my OH tells me off! Thanks Sarah – me too, I’m terrible for wasting time! I’ve become an expert at procrastination over the years, lol! Elizabeth recently posted…Win a foodie getaway for 2 to Eastbourne! Lol, great post, I too tend to lose my car in the car park. I love macaroni cheese and this looks delicious with the bacon added I make something similar using either bacon or chorizo depending on what’s in the fridge. I tend to park my car as far as I possibly can away from where I need to be so I can get my FitBit steps up. The furthest corner of the supermarket carpark is usually pretty empty so it’s hard not to lose the car there. 😉 Chorizo would be a lovely spicy variation with this recipe, for sure! Thanks Jazmin, that is definitely an easy swap. There’s also veggie versions of Parmesan available too! This looks so tasty. Going to try it. Hope mine is as good as yours. Oh I’m sure it will be! It’s a super easy recipe to make. Let me know how you get on! What a perfect winter warmer of a dish for the colder months…comfort food at its best! It sure is! 🙂 Thank you! The recipe is fantastic and I love the video of you popping it into the oven and then heading off on an adventure! Aw thanks Kate! Making the best of the time I’ve got! I always feel better after a hillwalk. Love the idea of a make ahead version and the bacon leeks and peas look right up my street! This is like Macaroni Cheese on steroids! I LOVE IT. I like when you take a classic and add tasty extras. I would love to try this as I keep dreaming of Mac N Cheese at the moment but it can be quite boring. This would be such a better tasting experience. P.S. I just love your pictures of your food, they just make my mouth water! I love love love mac and cheese! I’ve never thought about adding anything else in to the recipe but I do love the sound of this one! I love the sound of bacon in it! I’m a big fan of mac n’cheese too. Bacon always makes everything better – so it’s a great addition! I do love macaroni cheese but have never actually made it myself. Your recipe sounds easy and delicious though so I will add it to my list of things to try. I do probably spend too much time online, though not watching animal videos! It’s such a simple dish to make. I find tinned versions way too salty so I prefer to make my own. I love mac & cheese. This sounds like a cracking variation! Ohh food hack #5 is perfect for me! I am having a party in a few days and i always toast garlic bread in a toaster but this is such a goo idea! I love the idea of adding bacon to macaroni cheese, I wouldn’t have thought of it. Your stairs are amazing by the way, I love the patterned effect – is that paint or wallpaper? Oh yes please – there isn’t a mac & cheese I don’t like but your additions sound great. Anything that gives me extra time to spend with the ones I love is also a bonus. I don’t eat meat but I can easily leave out the bacon for this one! It’s making me hungry! In an hour I get a lot done. Mainly because I have to! With a toddler on the loose, his nap time means running around like a fiend doing all the stuff I can’t do when he’s awake! Oh man this looks so good with the bacon and the cheese and oh yes sign me up! My daughter loves he pet videos and I have to admit to wasting lots of time online! Love your Mac & Cheese which I know my hubby would like as when I make the veggie one that the kids like he always asks where the meat is! This looks amazing! i am going to try this recipe on my 6 year old as she is such a mac cheese fan. Ok my mouth is now watering this looks absolutely amazing – I totally need to try it out for myself. I love all the toppings you included in this mac and cheese! 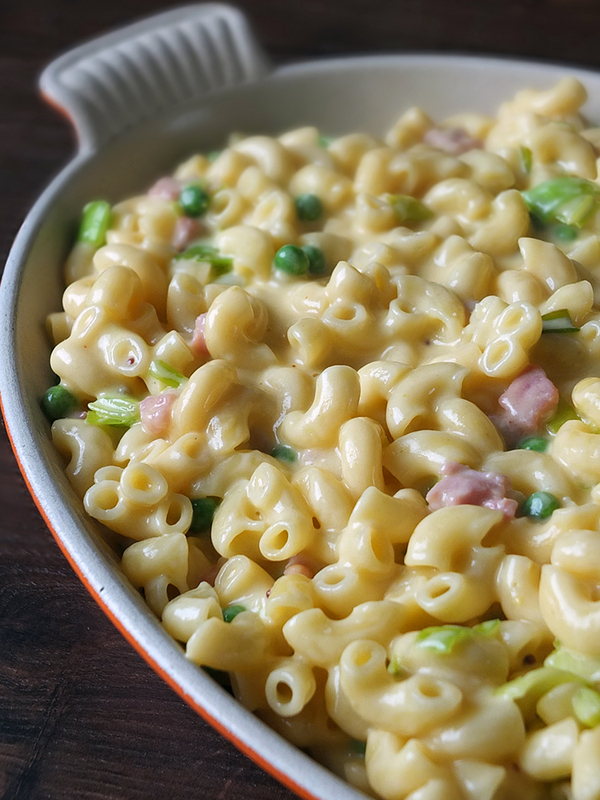 I love mac and cheese but usually feel like it’s too plain or that I need a protein so your recipe certainly makes me feel better about having a little comfort food! T loves macaroni and cheese. I’ve never made it thoug with bacon, leeks and peas, so I’d be really interested to try this one out. It’s such a winter recipe isn’t it? Love it! This mac and cheese looks to die for! I was about to say that I was excited to see leeks in a recipe because you never see them here in the States and then I realized that you’re from the Shetland Islands so no wonder you thought of leeks! This looks hearty and delicious! This post was a PLEASURE to read! Such a perfectly organized mac n cheese experience like I’ve never seen before. I totally agree with buying local and using the oven time to do multiple things at once. My husband hates cooking because he is somewhat disoriented in the kitchen – organizing things to do in an optimal way surely makes the whole thing more simpler, faster and better! I;m making mac & cheese today — what a wonderful inspiration, and I love all the hacks! I love mac and cheese so this is making me drool everywhere! I always pop bacon in mine, and garlic bread is the perfect accompaniment (carb heaven!!). I love the idea of getting in a quick bit of exercise while dinner’s cooking – definitely helps work up an appetite too! What a delicious looking mac’n’cheese and good tips too. I have never thought of freezing bacon. I now really fancy some macaroni cheese. Such a good insight into how much time we waste, preparation always makes things easier too! Who doesn’t love mac and cheese, I’d of course opt out the real bacon and put replacement but you’ve just got me wanting garlic bread also. LaaLaa recently posted…Yves Saint Laurent Elle.